← TIME SENSITIVE ACTION ITEM! Defend 2nd Amendment against Pres. Obama and UN Arms Treaty! Here is a new way to get an “Ask Father” question: Twitter! While they usually don’t wear one, I know of no universally authoritative statement that forbids a straw subdeacon from wearing a maniple whilst assisting at Mass. There is, however, a letter – signed by the then-Secretary Msgr. Perl but not addressed to an ecclesiastical authority – from Pontifical Commission “Ecclesia Dei” in 1993 said that straw-subdeacons may continue to be tolerated. That means that there can be straw-subdeacons. 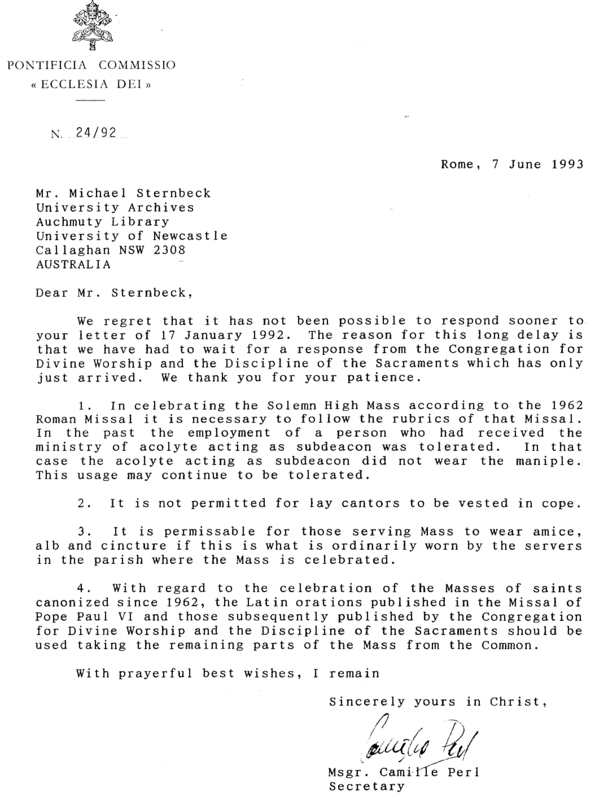 Perl’s 1993 letter also describes that, back when, the straw-subdeacon didn’t wear the maniple, but he doesn’t say it can’t be used now. He doesn’t cite any documents in this letter. In his reworking of Fortescue/O’Connell, Reid also states that they should use a biretta unless they are entitled to use one. I don’t know what establishes “entitlement” in this day and age. Perhaps acting as straw-subdeacon? Reid doesn’t back his prohibition up with a reference to documents. Neither of these sources are universally authoritative on the matter. Perhaps something will be issued someday by the competent authority. Therefore, it can probably be tolerated that straw subdeacons wear a biretta and maybe even – gasp – a maniple, where it is the custom for them to use them. And buy some Mystic Monk Coffee! Their sample packs make great small gifts. Hey! It’s Cyber Monday, okay? Monks gotta buy groceries too. Help them. Get great coffee. This entry was posted in "How To..." - Practical Notes, ASK FATHER Question Box, Liturgy Science Theatre 3000 and tagged biretta, maniple, straw subdeacon, subdeacon. Bookmark the permalink. 14 Responses to QUAERITUR: Maniple on straw-subdeacon? Wouldn’t it be problematic to take the principle of “that which is not forbidden is allowed” and apply it to liturgy? It would seem to open the door to all kinds of practices. Holding hands at the Our Father comes to mind (though I am not aware if that has been specifically reprobated). I think a serious renewal of the instituted ministries of acolyte and lector could go a long way in bringing about a restoration of the sacred in the liturgy. I chose the word “renewal”… I am not sure what word would be appropriate, since the instituted ministries have been practically ignored since Pope Paul VI established them. Aside from gently ushering women out of the sanctuaries in the Ordinary Form of the Roman Rite, think of all the solemn Masses we could have in the Extraordinary Form what with instituted acolytes (who, according to Paul VI, can be called subdeacons) and permanent deacons? I would imagine that in the past those who did the part of the Subdeacon, but were not yet really Subdeacons, were not allowed to wear the Maniple (by Decree(s) of the S.C.R.) in order to avoid confusion for the people, so that they would not be confused with real Subdeacons who had already been recipients of that specific (Major) Order. Also, because there was that thing about “impersonating” a major Cleric (due to the fact that the Maniple was the visible sign of the reception of a Major Order). Since it continues to be the case that an instituted Acolyte/Lector is still NOT a Subdeacon, it has been the common sense practice not to give them the Maniple. Yes, they can be given the name of Subdeacon and do what Subdeacons did (just like straw-Subdeacons) according to Paul VI, but the idea of giving them the Maniple now (especially when they do not receive them ceremonially when they are instituted Acolyte/Lector) seems a little too much. I know of many seminarians who would be happy to be able to wear the Maniple, but would it be considered safe in the seminary if they are seen wearing the Maniple? We all know how much Priests older than 60 suffer from Maniplophobia (the liturgical allergy that causes their entire spiritual system to shut down). It is like what holy water is for vampires. Re the Biretta, Dr. Reid never substantiated his prohibitive addition to Fortescue’s book. It would really not make sense that someone who is wearing sacred Vestments would not be given a Biretta! This should certainly be one of those cases where the greater includes the lesser. In the past, I would guess that seminarians received the Biretta (or were allowed to wear one) as soon as they were given the Cassock and Surplice (which is, as some Papal M.C. called it, “l’abito di religione”), so they would seem to “go together.” So, those who are “in choro” (wearing Cassock and Surplice, or whatever they are entitled to wear) would also wear a Biretta. (Servers wearing Cassocks and Surplices not wearing a Biretta is a different thing because they are serving, not in choir). In theory, it would seem difficult to find a place where it is already a “custom” to have straw Subdeacons wearing a Maniple (especially if they are not seminarians), but even if the seminarians wear them, I guess that they could also take the Maniple back to the seminary and use it to wipe off the perspiration that will ensue when their superiors find out that Maniples have been worn! On the other hand, there have been (and there still are in some cases) places where servers wear Dalmatics/Tunicles and Birettas for processions (Spain always comes to mind for these things). It is clearly stated in all contemporary rubrical manuals that deal with a substitute (straw) subdeacon, that he is prohibited from wearing the maniple, as well as doing certain actions that only an ordained subdeacon may do (e.g., pouring water in the chalice for the Offertory, removing the pall before C’s Communion of the Precious Blood). Furthermore, the maniple is reserved to those who are ordained to major orders, hence why it is one of the symbols associated with the subdiaconate. These same rule continue to apply (they have not been superseded as the 1962 rubrics are still in force), which the Ecclesia Dei Commission confirmed regarding one ordained an acolyte (or in the case of communities that still use the traditional clerical formation, tonsured cleric). In my opinion, if anything should multiple, it’s tonsured clerics and transitional subdeacons! PS: there is no prohibition (or restriction) on a substitute subdeacon wearing a biretta and he in fact should. This is because the biretta is proper to all members of the clergy, including those merely tonsured or ordained to the minor holy orders, thus including that of acolyte. The difference is that the inferior ministers (the acolytes, which includes the MC, Th, etc.) never wear a biretta, as a distinction from that of the sacred ministers and those clergy assisting in choir. Cf. this article for some more biretta-quette: http://romanitaspress.com/articles/biretta-quette.htmhttp://romanitaspress.com/articles/biretta-quette.htm. Interesting comments to my brother Gabriel’s question. I am of mixed mind on this. What made one a subdeacon? Certainly not getting a maniple. The matter of the subdeaconate was the traditio instrumentorum. That is to say the presentation of the Chalice and Paten and of the Epistolarium. The candidates were then given the Amice and Maniple, but that did not constitute them in the Order. That receiving the Maniple is somehow necessary to receive a Major Order is impossible. Priests and Deacons ordained in the Ordinary Form do not receive it but are still priests and deacons. In fact, the modern Acolyte (who may also be called a “subdeacon” if the Bishops’ Conference so decides) has received as part of his installation the instruments, i.e. the Chalice and Paten, and has previously received the Epistolarium (indeed the whole lectionary) when installed as lector. The modern rite for an acolyte is not that of the older liturgy: the instrument given in for that old order was a candle. Given that the rite of installation for a modern acolyte is that which preserves the forms of the older ones for the subdeacon and that a modern acolyte can be called a subdeacon, I find it hard to believe that an installed acolyte cannot function in all respects as a subdeacon. If not being given the maniple excludes wearing it, then those ordained priest or deacon in the new liturgy cannot wear it either, even when celebrating the EF. The point here is not whether “staw subdeacons” (i.e. lay men not installed in any ministry or recipient of any order) can wear the Maniple. I don’t know: I think an explicit decision is needed. But for installed acolytes, I think they can function in all respects (actions, vestments) as a subdeacon, at least until an explicit decision to the contrary is issued. In dubiis libertas. One final note. In the Dominican Rite the cope and dalmatic is not used at the Asperges. So, if an installed acolyte cannot wear the Maniple when he functions as a subdeacon, then his vesting is identical to the acolytes on major feasts, when Dominican acolytes wear the amice, alb, and cinture. This would also be the case on ferials at Mass, since in the Dominican Rite no dalmatics are used on ferials, just the sole and maniple for the deacon and the maniple alone for the subdeacon. Again, the subdeacon would look like an acolyte. Odd to say the least. Again, I make no claim for what a “straw subdeacon” should wear or do, but I do have it on good authority that it was common in the pre-Vatican-II period for lay brothers (who have no orders at all) to function as “straw subdeacons” performing all the actions and wearing the maniple. The source is a lay brother who did this. Was this “permitted”? I don’t know. I think a lot of this was play it by ear, in reality. I’ve heard of cases where they trained the sacristan to be a straw subdeacon or a lay brother (ICRSS) to do the same. As far as the instituted ministries go, I think they were made to give an “in” to women in the sanctuary. Why? Remember when all the litniks bellyached about all the medieval “accretions” in the liturgy? The Minor Orders and Subdiaconate were something that was demonstrably old, well beyond medieval times. Why did they get the axe? They are old, they are authentic, they are from the Early Church…they are too “patriarchal”. Ditching them, replacing them with optional “institutions” (that practically guaranteed they’d be restricted to the seminary if anything) and then giving the option of deputizing first laymen and then laywomen as well was the point. Why else would only dioceses like Lincoln, NE have instituted acolytes and lectors outside of the seminary system? I remember going to an institution ceremony at the Newman Center in Lincoln with Bishop Bruskewicz and thinking, “Wha…hmm…this is interesting. I’ve never heard of this before…” No wonder. I say let straw subdeacons (and instituted acolyte subdeacons…) multiply wherever they are wanted. Laywomen can give out the Precious Body and Blood of Our Lord, I don’t see why we need to keep up the charade of supposedly reserving the handling of Sacred Vessels and the like the specifically Priesthood bound “clerics” (who aren’t even real clerics by Law anymore anyway…) and wearing certain bits of damask that anyone can touch. S.R.C. 4181 does not apply to an installed acolyte, whom I argue above is installed by the same rite as a subdeacon and can be called one. A “clericus” might only be tonsured and have no order at all. Hmm. Good point, Father. To my mind it only makes sense that, if a tonsured cleric may not use the maniple, a non-cleric would certainly not be permitted its use either. But I can see how some would argue otherwise. One more reason to bring back the Minor Orders…. Something that has not been mentioned so far is that, in the old days, the public promise of celibacy was part of the ceremony for ordination to the Subdiaconate. Subdeacons also took on the obligation of praying the Divine Office. Those are two differences from the modern Instituted Ministry of Acolyte and its associated ceremonies. The Latin Church has a long history of linking ministry at the altar with celibacy, and ordination to the Subdiaconate was, in the old days, the boundary line for that important distinction. (Of course, I’m thinking of secular clergy mainly. I presume that religious may well have professed celibacy at some earlier part of their admission into religious life, which might account for practices among lay brothers of the Dominicans, as Fr. Augustine mentioned–i.e., that there would not seem to be a problem with a celibate lay brother, without any minor or major clerical orders, acting as a straw subdeacon.) It seems that the old attitude was that only those committed to celibacy would be allowed to exercise the ministries most closely associated with the Sacrifice at the altar, and that the wearing of distinctive vestments and the handling of the sacred vessels went with it. That would seem to account for the old rules that straw subdeacons did not carry the chalice from the credence table to the altar at the offertory, did not pour the water into the chalice at the offertory, did not hold the paten in the humeral veil during the canon, did not return the chalie to the credence table after the ablutions, and probably a few other points that I don’t recall. Also, in the old canon law, touching the sacred vessels without being at least a subdeacon or being specially commissioned by the ordinary to do so (e.g., as sacristans would have been) was a canonical irregularity that was an impediment to orders. (Not a permanent impediment, but still a canonical impediment that had to be cleared up.) Wearing a vestment of a superior clerical order was also a canonical problem, and the maniple was included in that. So there were serious reasons why seminarians who wanted to advance in Holy Orders but who were not yet subdeacons would not dare to wear a maniple or touch the sacred vessels, even if on some occasion they functioned as a straw subdeacon. The new liturgical and canonical norms have changed much of this. I think, however, that those of us who are interested in the older liturgical forms should strive to consider the rationale behind the old practices and consider whether the changes that have occurred were really wise decisions. I think that sometimes the newer laws allow things that are not really good ideas, and that rediscovering the reasoning behind the older practices might help to guide the path of the newer practices. Fr. Z. and Ed Peters–my friend–can a married deacon whose relations with his wife are unknown therefore be forbidden to serve at as deacon at a EF form Mass? I think not. So the matrimonial status is not relevant. The issue is whether an installed subdeacon of the new rite (as what an acolyte of the new rite may be called if the bishops agree) can function as a subdeacon in EF Masses (and, sigh, use the maniple) . As all installed acolytes, unless it is an unusual diocese, are men in formation for orders or final vows of chastity, they are, assumed, at the time of their installation to be in formation for the celibate state. But that is really irrelevant. Otherwise, most permanent deacons could not serve as deacons at EF Masses. Which is absurd. Right, Fr. Z? Fr. Augustine, I’m afraid I was clearer in my own mind than what I managed to communicate in writing. My main point is that the older forms of liturgical practice and canon law had many things that were intertwined and connected in ways that are not always obvious at first glance, but which may have had a very good rationale behind the practices. If one part of the intertwined liturgical and canonical discipline is changed, a chain-reaction of other consequences begins. I think that is the situation here. Things which were automatically associated and connected in the old days (clerical satus, celibacy, and the maniple for the subdeacon of the Mass) are no longer automatically connected. Confusion over certain points of practice is the result. I was trying to suggest that efforts to determine a “correct” practice for certain ambiguous details of the Extraordinary Form, given the current unclear circumstances, ought to try to consider all of the factors that went into the old practice, including those factors that might not be obvious. The comparison of the old rite of ordination to the subdiaconate and the new rite of institution as an acolyte mentioned several equivalent elements, which I do not dispute. The part about celibacy is a difference which might shed some light on what the reasoning behind some of the old practices were. It seems clear to me that the old disciplines assumed a connection between celibacy and serving as a major minister of the Mass. The major ministers of the Mass also clearly had distinctive vestments that the minor orders of clergy did not use. The maniple was a vestment that was not allowed to those below the order of subdeacon. It might just be coincidence that celibacy, maniples, and the subdiaconate were linked together. Or it might not. I don’t want to be too quick to dismiss it as having had no connection. The current disciplines of the Church are different from the old ones. I agree with Fr. Z, who has stated on numerous occasions that deacons are deacons, whether transitional or permanent, and that permanent deacons can function in the Extraordinary Form. Whether the modern instituted acolytes are entirely the same as old-style subdeacons is not entirely clear. I agree that they are mostly the same, but I hesitate to say that they are exactly the same and that they thus certainly should wear the maniple. Since there used to be careful regulations on this point of wearing or not wearing the maniple, I think people should be cautious about how to handle the current unclear situation. I hope that the competent authorities will provide clarification. I noticed that no one has yet mentioned that an instituted subdeacon has been explicitly entrusted “the functions heretofore assigned to the [ordained] subdiaconate.” Ministeria quaedam § 4. That passage seems, to me, pretty good evidence that instituted subdeacons act as subdeacons and not as substitute laypersons. Consider: “straw” subdeacons do not fulfill all of the functions of the subdiaconate. They do most, but not all, of what a subdeacon does. If the subdiaconate’s functions have been assigned to instituted subdeacons, then all of the functions—and not simply some of them that a layperson can do otherwise sans institution—have been assigned to the instituted subdeacon. Father Augustine’s mention of the traditio instrumentorum points out an interesting similarity between the ordination of subdeacons and the institution of subdeacons. However, an (important? trivial?) difference is that, in the ordination rite, ordinands were given an empty chalice and paten, while in the rite of institution, candidates are given either a ciborium containing unconsecrated bread or a chalice containing unconsecrated wine. So that may alter the analysis of whether an instituted subdeacon goes through an equivalent ceremony as the ordained subdeacon. The fact that the instituted subdeacon is not a cleric may be irrelevant. Ministeria quaedam, the document that assigned the functions of the ordained subdeacon to the instituted subdeacon, is the same document that fixed the clerical state to the diaconate. Thus, it would appear that the lack of the clerical state in the instituted subdeacon is not an impediment to exercising the functions granted. These are just my thoughts, though, and I welcome correction. This is an interesting matter.